When people buy home security systems, there’s a belief that it will help ensure a swift police response in the event of a break-in or other incident. In a press release announced by Pleasanton-based Deep Sentinel, the study looks at police responses to home security alarms and finds that a large number of these calls go unanswered. In fact, due to the high number of false alarms, dozens of cities have adopted non-response policies. Notably, San Jose, San Francisco, Fremont and Las Vegas are among the 26 cities with a combined population of a combined population of 7,218,593 categorically that will NOT respond to alarm calls. ● For more than 40 percent of residents living in U.S. cities with a population of around 50,000 or more, police will not respond or will not guarantee that they will respond to residential alarm calls. ● In America’s most populous cities with one million or more residents, nearly 80 percent have no guaranteed police coverage for their alarms. Police in these cities, ranging from New York City to San Jose, say they will not respond or cannot guarantee they will respond to these calls. ● 26 cities with a combined population of a combined population of 7,218,593 categorically will NOT respond to alarm calls. This represents 6 percent of the total 126 million people covered by the study. ● Police response to home alarm calls varies across states. In the image below, states with lighter colors are more likely to respond to an event than those in deep red, where cities surveyed within that state will not respond or do not guarantee a response. To find out if police respond to alarm calls in your city, search the Deep Sentinel False Alarm database. A key reason for the lack of police response to home security calls is due to false alarms. According to data from the Center from Problem Oriented Policing, police respond to more than 36 million alarm activations every year in the U.S., which costs an estimated $1.8 billion. Most of these calls are false. Additional law enforcement agency research from Deep Sentinel Labs underscores this study, revealing that law enforcement agencies across the country say that 95 percent of alarm calls are false. As a result, they have stopped responding to alarms from alarm companies, finding them very costly and a drain on agency resources that could otherwise be used to address real offenses. For the purposes of this study, Deep Sentinel Labs analyzed all U.S. cities with a population over 50,000 according to the 2017 U.S. Census Bureau. 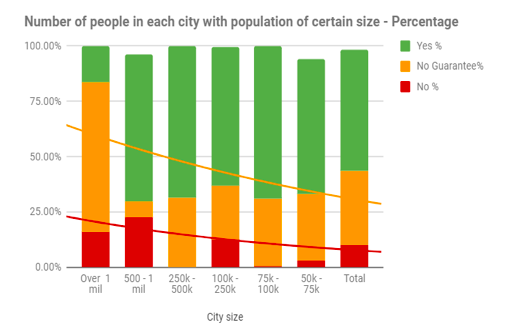 The populations of these cities range from 50,000 to 8.6 million, a study covering a total population of 126,000,000. The analysis performed analyzed all city and local laws and policies governing how law enforcement responds to residential home alarm calls: local civic codes, city’s ordinances. Further, these legal restrictions were validated by contacting local police departments by phone. The result of this primary research was then tabulated and analyzed. Deep Sentinel is a pioneer in AI-based home protection. The company’s intelligent crime prevention transforms home security from false alarms and ineffective after-the-fact crime alerts to real-time crime prediction and prevention. With Deep Sentinel, Americans can gain a reliable, cost-effective way to protect their homes and stop a burglary, mail theft or driveway break-in before it happens – and feel dramatically safer at home, at work and on vacation. www.deepsentinel.com.